Below is a blog post written by the Burke’s current Primary Source Intern, Andrew McLaren. Andrew McLaren is a Ph.D. candidate in the Department of Religion at Columbia.Andrew McLaren is a Ph.D. candidate in the Department of Religion at Columbia University. His dissertation research focuses on a historiographical text about conquests and politics in the first three centuries of Islam, as well as its reception in various geographical and linguistic contexts and understandings of history. More broadly, he is interested in the function of the writing of texts in social history, particularly in historiography, theology, and law. The staff at the Burke is thrilled that Andrew will continue to work with us into the next academic year, and we’re thrilled to make this special collection available for research. You can also read Andrew’s post on the Columbia University Libraries Internship Program blog. Henry Boynton Smith (1815-1877) was professor and librarian at Union Theological Seminary from 1850 to 1874, joining the faculty at UTS after serving as a Congregationalist minister (1842-1847) and teaching philosophy at Amherst College (1847-1850). 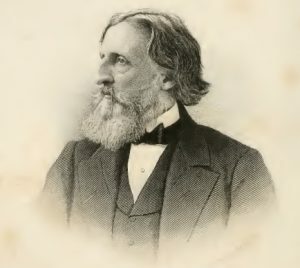 Smith is perhaps best remembered for the active role he played in the reunion of the Old and New Schools of the Presbyterian Church, beginning with his election as moderator of the General Assembly of the New School denomination in 1863. He also wielded significant influence in the growth of the study of church history in America. Photo 1. Steel plate of H.B. Smith by Ritchie. Photo 2. “So you see my time is likely to be full…” H.B. Smith’s class list. Spring 1839. European philosophy in the lifetime of Henry Boynton Smith is usually thought of as sliding into stagnation, its energy sapped by the rise of the natural sciences. But as Frederick Beiser argued in a recent book, that narrative is largely incorrect; rather, the time between 1840 and 1900 actually saw a flourishing among philosophers desperately grappling with a confounded sense of purpose: what role should philosophy play in modern intellectual projects, like the natural sciences? In this flourishing landscape, Beiser argues, many different stories can and should be told. 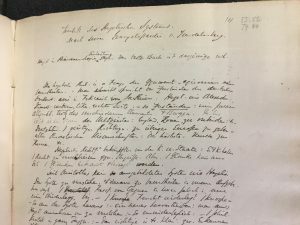 One story has been recently related by Annette Aubert in her work on the influence of German theologians on their American counterparts, where she argues that H.B. Smith and other students who studied in Europe played a key role in the interpreting those ideas and translating them to America. As the documents in H.B. Smith’s papers show, the thoroughfares and the byways of his career crisscrossed through the verdant intellectual landscape sketched by Beiser and Aubert. For instance, one of Beiser’s main characters, Adolf Trendelenburg (1802-1872), is one of the teachers mentioned in Smith’s course list, and Smith left behind a notebook full of detailed notes on Trendelenburg’s lecture course entitled Kritik des Hegelischen Systems (“Criticism of the Hegelian System”). 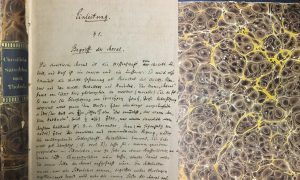 Among the papers are also several notebooks from classes with Friedrich August Gottreu Tholuck (1799-1877), a theology professor at the University of Halle and prolific author and preacher. With him, Smith studied Christian ethics, dogmatic theology, the Pauline letters (about which Tholuck wrote a famous commentary), and theological literature more generally. 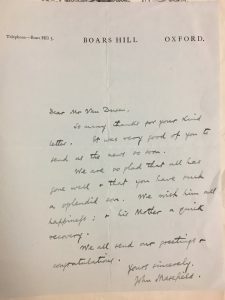 Smith maintained a lifelong relationship with many of his teachers, including Tholuck—12 letters from him are found among Smith’s correspondence. Of further interest are the notes of Smith’s own students at Union in the 1850s and 1860s, which were used in the posthumous publication of three volumes of Smith’s lectures in systematic theology. Even a quick perusal of the pages reveals that Hegel and other German thinkers are not absent from Smith’s work, but their appearance here alongside a broader swathe of philosophers (including English and French thinkers, from David Hume to Auguste Comte) reveals both Smith’s own erudition and the space of interaction into which he carried his German education. All of these intellectual currents are addressed within the broad gaze of Smith’s theology. Photo 5. 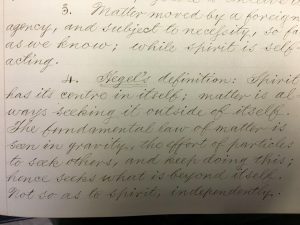 Page from Systematic Theology notebook, giving Hegel’s definition of spirit. The history of philosophy in the late 19th century took many roads, some less-travelled than others. The papers and publications of Henry Boynton Smith show how one of those roads, travelled by a precocious young man from Maine, passed directly through Union, marked by a collection of signposts and waypoints in the Burke archives. A.G. Aubert: “Henry Boynton Smith and Church History in Nineteenth-Century America,” Church History 85, no. 2 (2016), 302-327. A.G. Aubert, The German Roots of Nineteenth-Century American Theology. New York: Oxford University Press, 2013. Beiser,After Hegel: German Philosophy, 1840-1900. Princeton, NJ and Oxford: Princeton University Press, 2014. Smith,Henry Boynton Smith: his Life and Work. New York: Armstrong and Son, 1881. 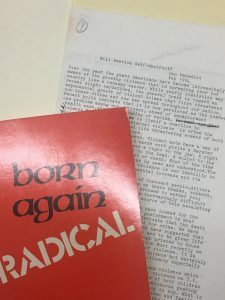 This entry was posted in Archives, Collections, History, Student projects, Union Theological Seminary History on August 25, 2017 by Rebecca Nieto. N.B. : The following post was written by Bo Reynolds, a recent M.Div. 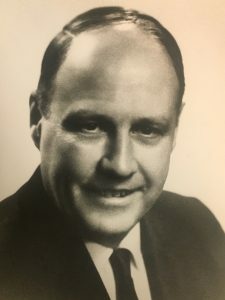 graduate from Union and current archives assistant processing the papers of Norman and Margaret Eddy with the generous financial support of the Eddy family. Read more to learn about Bo’s spring working with this collection at the Burke! And congratulations to Bo and the rest of Union’s Class of 2017! 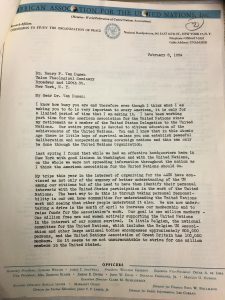 Since November 2016 I’ve been working as an intern in the Burke Library, specifically hired to process the Norman and Peg Eddy papers. 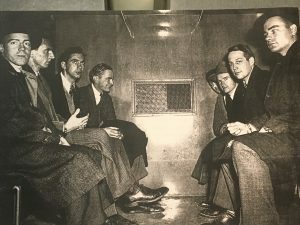 The collection is a large one, with their photos, journals, correspondence, and personal archives filling 86 banker’s boxes which, when lined up side to side, extend over 118 linear feet. 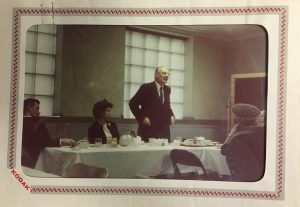 Norman and Margaret (Peg) were both Union alumni, members of the class of 1951, and dedicated their lives to ministering in East Harlem, initially through involvement with the East Harlem Protestant Parish and continuing with the different ministries and churches which were the heirs of EHPP’s spiritual legacy. Norman and Peg’s family, particularly their daughter Martha Eddy, continue to be actively involved with the collection as they work on compiling a biographical narrative of their parent’s faith and service. I have a greater grasp on Norman’s life than I do Peg’s by virtue of his many varied autobiographical efforts and his meticulous preservation of his journals, essays, work-related materials, and correspondence dating back into his year spent as an exchange student at The Stowe School in 1937-1938 (where he became acquainted with Christopher Robin, son of AA Milne, author of Winnie the Pooh). 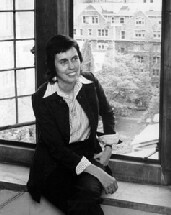 Norman later studied at Yale, while Peg studied at Smith. Norman completed his course of study at Yale early, leading the class effort to acquire their degrees ahead of schedule in order to be able to serve in the war effort; he volunteered for the American Field Service as an ambulance driver. Peg’s Union Diploma, May 22, 1951. 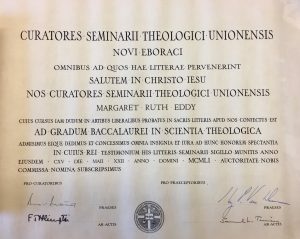 UTS1: Norman and Margaret Eddy Papers, The Burke Library at Union Theological Seminary, Columbia University in the City of New York. spiritual vision: His was in the Syrian desert, hers at a light house in Nantucket. 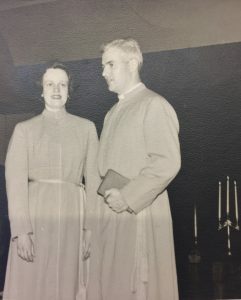 They both sensed that the Holy Spirit was at work broadly within the world, drawing people of faith and goodwill into cooperative efforts to address social ills; they both entered Union Theological Seminary in 1948, married in 1950, and graduated and were ordained in Congregationalist churches in 1951. They had become individually aware of the ministry efforts in East Harlem by the East Harlem Protestant Parish during their time at UTS and became co-pastors of the 100th street storefront church for the first five years of their ministries. Norman and Peg lived and worked in East Harlem for the entirety of their ministries, with a deep commitment not only to their parishioners, but to the neighborhood itself and its citizens. I am not studying archival science; I came to Union Theological Seminary in order to prepare myself for parish ministry in the Episcopal Church. As I spend time organizing, preserving, and reading the materials left behind by Norman and Peg Eddy, I am continually inspired by the work and faith of the Eddy family. Their energy seems boundless as they tackled school reform, local elections, the formation of a credit union, the construction of two new church buildings, a committee to assist those addicted to Narcotics, global travel, interfaith work, and numerous sermons and essays. Their love for their neighborhood and their neighbors is immediately evident the amount of support, tangible and intangible, that they gave through reference letters for first-generation college students, advocacy and pastoral support for the incarcerated, anonymous donations to families in need, housing and shelter for those who had none; the list goes on. 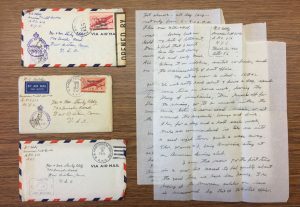 Some of Norman’s letters from WWII (January, April, June 1943). UTS1: Norman and Margaret Eddy Papers, the Burke Library at Union Theological Seminary, Columbia University in the City of New York. I am mindful, however, not to stray into writing hagiography. Their life’s work came with great personal cost at times and there are many instances of setback, heartbreak, and frustration present in their letters and journals. For me, though, the Eddys represent a life of true solidarity with those that they served. They lived in the community alongside their parishioners and made the cares and struggles of East Harlem their own. I read and handle their materials with deep gratitude for their race well-run and for the opportunity to encounter their ministries and stories in such a deeply personal manner. As I graduate and move on from Union towards a life of ordained ministry, I will remember the example and faith of Norman and Peg Eddy as I seek to walk in solidarity with people of faith and goodwill in service to ‘the least of these’. 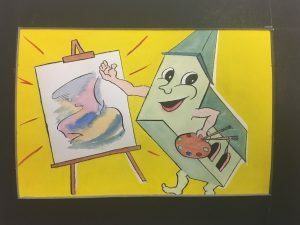 This entry was posted in Collections on June 2, 2017 by Rebecca Nieto. This fall I have had the good fortune of working in the archives of the Burke Library at Union Theological Seminary an apply, in a real world environment, what hitherto had only been theoretical. I had the benefit of taking an archiving class concurrent to my work here, which informed much of this experience. Conversely, my time at the Burke gave salience to issues and concerns we investigated in a classroom environment. I processed a total of four collections which were all rather heterogeneous. 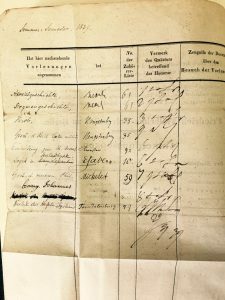 The first were the papers of Dr. Christopher Morse, a professor who spent the bulk of his career at Union and who is credited with creating the Bonhoeffer Chair in Theology and Ethics. His papers represent a rather contemporary collection. Along with printed articles and the like were computer diskettes of varying antiquity. 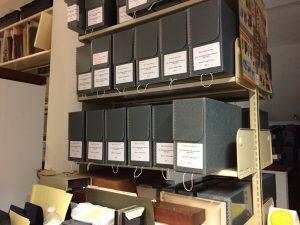 Professor Morse’s papers comprised about 12 1/2 boxes of material which were primarily scholarly in nature. Archival boxes holding the Morse Papers just after processing. A smaller but no less fascinating collection were the papers of Titus and Fidelia Coan, 18th century missionaries who settled in Hawaii. Titus Coan was very peripatetic, traveling to Patagonia and the Marquesas islands as part of his missionary calling. The papers donated were letters that Titus and Fidelia exchanged between one another. The beauty of the language and the sheer volume of letters the Coans exchanged were quite inspired. Another small collection that I process belonged to Eitel Proelss, a German born theologian who, like his contemporary Dietrich Bonhoeffer, belonged to the Confessing Church and resisted Nazi influence during WWII. Proelss was sentenced to hard labor but survived the war. Proelss eventually became interested in criminality and began a program at UTS that merged pastoral care with psychology. He also served as the Chaplain of Rikers island for 10 years . 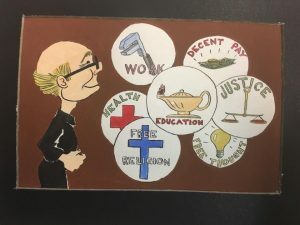 His papers offer a glimpse at the thoughts of an individual concerned for well-being of the incarcerated and assured of the redemptive possibilities for criminalized people. My last collection was that of an individual named Arthur Mason Brown , whose grandfather, Francis Brown, was the seventh president of Union Theological Seminary. Arthur Mason Brown was born and grew up in present day Syria and served in the Navy during World War II. He eventually moved Egypt where he taught at the The American University of Cairo, also preaching at the Maadi Church in Maadi, Egypt. 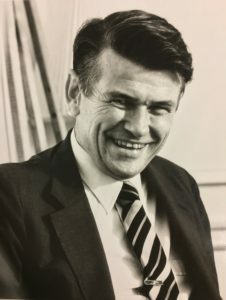 Though he eventually settled in the States, Brown returned to the Middle East for a year in 1971 to teach at the American University in Beirut. In his teaching years he found himself at a number of different institutions in the States, but spent the bulk of his career at Bates College in Maine. It was there that he suffered a devastating stroke which is said to had triggered a crisis of faith in him. After he stopped teaching and preaching, he devoted his energy to Haiku poems, two books of which are included in the collection. Most of Brown’s archival papers are sermons. These are abundant and a number of them exist in several different versions. It was challenging to fix an accurate chronology for them all and hopefully I have done an adequate job of it. There are also photos and the Haikus which provide a welcome contrast to the preponderance of sermons. All in all, it has been a blessing to have had the opportunity to work here alongside – and with the guidance- of the knowledgeable and generous staff at the Burke. This has whetted my appetite to pursue more opportunities in this field, and I am grateful for having been given the chance to work here. This entry was posted in Collections on December 16, 2016 by Rebecca Nieto.